Why even consider “maximizing” mineral absorption? I’m not saying this to concern you about mineral absorption, just to give a few tips and ideas how to make something that’s already awesome even better. You’ve probably heard of one of the biggest health trends now: Bone Broth. It’s true that bone broth can have a lot of nutrients, including minerals, but you may not be getting as much as you’ve been led to believe. Did I forget to say it’s also oh SO very easy to prepare? There are several techniques I use to maximize the levels of absorbable minerals in my recipe – but it’s still super-easy! 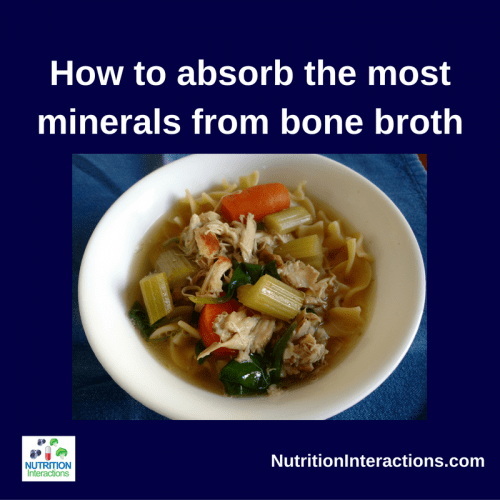 I personally make an effort to maximize mineral absorption because I’m maximizing my own bone health (of course minerals are necessary for much more than just strong bones). There are several things you can do to maximize your own ability to absorb minerals. You have teeth covered in super-strong enamel made precisely for breaking food into smaller pieces. The smaller the bits, the more surface area you create, which gives more places for the digestive enzymes and absorption cells to access the nutrients. and, it also helps your body absorb minerals. 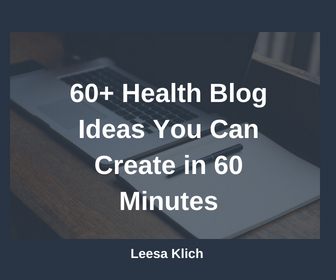 Note from Leesa: I’m not saying you should stop supplementing with minerals or taking antacids! I’m just suggesting that you can try to maximize the amount you get from food, which might just help to minimize the amount you need from supplements. Many mineral-rich plants contain “anti-nutrients”. Oxalates are not inherently bad for you, in fact your body makes them from vitamin C if necessary. However, if you’re trying to increase your mineral absorption (or are prone to kidney stones), you may consider reducing how much oxalate you eat. Note from Leesa: Contrary to what you may have heard, eating raw grains and greens does not leach minerals from our bodies; what actually happens is that the minerals in those anti-nutrient-containing foods are more difficult to absorb. This means some of them will just pass right through you instead of getting into your body where it’s needed. Nope, not nearly close to the 300 mg/cup that milk has, but we’ve done some things to help make sure you absorb as much calcium as you can. A cup of raw greens boils down to a tiny amount, so feel free to add lots of greens to the broth/soup. As mentioned earlier, some of that calcium in the plants are bound up in oxalates. Of course, milk/dairy products, orange juice, cereals and many plant-based milks are often fortified with vitamin D3 (check your labels). Many people supplement with vitamin D3; however, too much can be toxic in too-high doses, so you can get your blood levels of 25-OH vitamin D checked to make sure. There is another thing that can help you absorb your iron from leafy greens (and other vegetables) – that is vitamin C.
The irony (pun intended) of this recipe is that vitamin C levels reduce upon cooking! Vitamin C is a very unstable molecule. It is this very nature of instability that makes it a great antioxidant. Basically vitamin C sacrifices itself to absorb free radicals. This also makes vitamin C vulnerable to exposures to heat, light and long-term storage and its potency declines. This is precisely why I add the greens into the soup for the last 30 minutes only, and don’t simmer them for 24-hours like the rest of the ingredients. You can also increase your vitamin C intake by adding a squeeze of lemon or some chopped bell peppers to your soup right before you eat it. You can also have some berries or citrus for dessert right after finishing your bowl. I add some kelp flakes to the recipe for iodine. Don’t add too much or it will start to taste a bit “fishy”. The reason I add it is because I don’t eat a lot of iodized salt or processed food that contains a lot of iodized salt. Don’t get me wrong, there is nothing wrong with iodized salt, but having lived on an island in the Atlantic for four years, I have come to love local (Canadian) sea salt. One thing is absolutely true about Himalayan salt – it’s a great source of sodium (from far, far away). I start with a whole chicken, and I roast (18) or slow cook it (19) with veggies for dinner. This is the night before I plan to serve the chicken soup. Then I take those bones & any leftover meat and add it to the slow cooker along with the apple cider vinegar, bay leaves, carrots, celery, cooked onions, spices, seaweed flakes, salt & pepper. Cover with water – this may be a couple of liters (I’ve never measured). Put it on the “keep warm” setting overnight. In the morning I turn it up to “low” to simmer all day. About half-hour before dinner time I add several handfuls of greens (spinach or kale). Now you can strain everything out and just drink the broth/stock, but I prefer to actually eat the meat and veggies, and not rely only on what nutrients have seeped into the water. Also, my kids like egg noodles in it, so at this time I’ll start boiling a separate pot of water for them. You could try rice or potatoes if you like. Of course these starches are optional if you’re sensitive to gluten or grains, or if you’re limiting your carb intake. That’s it – super easy & very yummy!